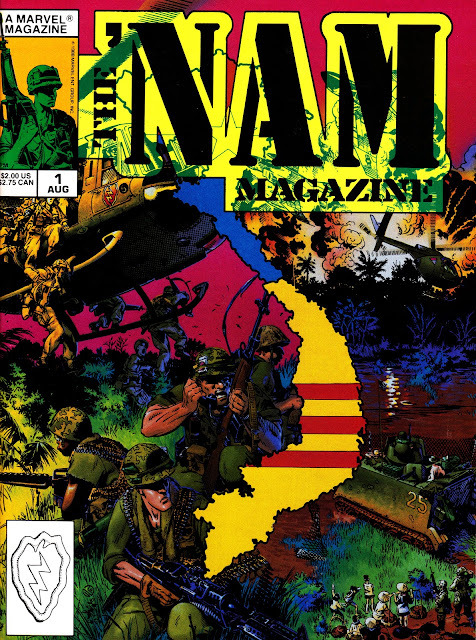 From August 1988: THE 'NAM MAGAZINE issue 1, published by Marvel New York. Marvel launched the four-colour comic book version in the last quarter of 1986 (with a December cover date) and successfully tapped into to the Vietnam War zeitgeist that was running hot in popular culture (Marvel's corporate parent, New World, also had the TOUR OF DUTY TV show on CBS from September 1987 and, although not directly linked, the comic book must have helped convince the studio to bankroll the show). Not an obvious choice for a mainstream publisher but, thanks to lots of press coverage, an early hit. Although the glory days of the category had faded a decade earlier, Marvel were still periodically returning to the black & white magazine genre and launched this reprint title (collecting two issues a time) in the summer of 1988. Presumably they believed it would appeal to latecomers and also older readers who wouldn't entertain a comic but would happily indulge in something less colourful. The early issues were written by veteran Doug Murray and illustrated by Michael Golden, following a successful collaboration on a similar story for Marvel's oft overlooked SAVAGE TALES magazine. After the first year, the creative team changed and the title's fortunes began to wane, culminating with the decision to feature The Punisher in the hopes that the run would attract his fans to the book. Despite the turmoil, it still clocked up a respectable 84 issues through to 1993. This magazine version notched up 20 issues. The early issues were also reprinted (long before Frank Castle became part of the story) in Marvel UK's PUNISHER weekly. Marvel tried to capitalise with SEMPER FI, another colour book this time dedicated to the US Marine Corps. Lightening didn't strike twice and it shuttered after only nine issues over 1988-89.